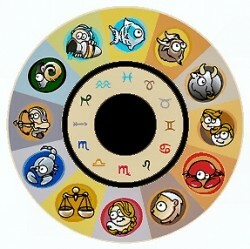 A horoscope essentially predicts how a period of time will go for someone and is based on his or her astrological sign. The period of time usually is for a specific day but also could be for a week, month or an entire year. Many people enjoy reading horoscopes with some doing so for entertainment value while others take them much more seriously. Those who take them seriously often times will allow their lives to be influenced by their daily horoscope predictions to some degree. If there is a warning of some sort of bad thing happening at work, for example, a true believer might call in sick to avoid work that day. A horoscope is based on astrological signs the roughly correspond with each month but not by exact dates. Astrological signs essentially are derivatives of zodiac signs created from specific star alignments. The word “horoscope” comes from the Greek words that basically refer to a look at the hours when someone was born. More specifically, it refers to the position of the stars, sun, moon and other planets at the time someone was born and their relative position at any given time of the year. Their position has influence over the daily events that occur and how people might react to them based on their astrological sign, which is how horoscopes in general are created. There are 12 signs in all that are based on the positions of the planets and stars at the time someone is born. The idea is that those varying positions have a lasting influence over the people born when they are prominent in the sky and can predict the future for those people to some degree. Personality types often times are ascribed to people’s astrological signs, such as people who are born as a Taurus, which is represented by the bull, such as being as stubborn as a bull. Whether right or wrong, the generalities of astrological signs can make them accurate to some degree over the long run. Another aspect of horoscope creation is “angles,” of which there are four primary angles in a horoscope. The most powerful is the “Ascendant” angle, which is referred to as the “first house.” The Ascendant angle is located in the east and refers to the rising sun and how it intersects with the horizon. It is considered to be the most powerful of the four primary angles because it is the point at which things that cannot be seen begin to rise up and appear in the sky, such as the rising sun and planets to the east. The second most important angle is the “Midheaven” angle, which refers to the sun when it is at its highest point during the day. It also is referred to as the south or “Tenth House” position on the astrological charts from which horoscopes are derived. The sun, of course, is at its highest point at noon each day, so the Midheaven refers to the noontime position of the sun, stars and planets. The other angles are the “Descendant,” which is the “Seventh House” and refers to the sun’s position in the horizon to the west at dusk, and the “Imum Coel,” which is the “Fourth House” to the north and generally refers to the midnight position of the sun, stars and planets. The angles impact horoscopes in different ways. For horoscope purposes, the Ascendant angle of the First House affects appearance and outer personality. It refers not only to how people physically appear but how they also appear to others on a personal level. The personality might be seen as brash or outgoing while another might seem subdued and introverted. By way of example, a rising Taurus sign would indicate a person who is a Taurus likely would take his or her time and gain momentum before doing something. By contrast, an Aries rising would signify an Aries person who will act suddenly with little forethought before acting. The Fourth House refers to someone’s life early on and how he or she was raised. The Fourth House generally predicts how someone of a particular sign will behave in domestic situations. Because it refers to how someone was raised, it also bases future predictions on how that same person will act for the rest of his or her life based on the upbringing during early childhood. In many ways, the Fourth House mirrors the environmental rearing aspect of psychology and how it can impact someone for the rest of his or her life. The Seventh House generally refers to other people and how they interact with people of a specific sign. The other people are equals and could refer to a spouse or even an enemy and how they might influence daily events. For marriage purposes the Seventh House only refers to the first marriage. If there is a subsequent marriage, other houses would refer to them when it comes to determining the predictions of a horoscope. The Tenth House influences the careers of people as well as their goals in life. Those who have purposeful careers and goals in their lives generally live longer, happier lives, as determined by the Tenth House. The positions of the sun and planets on given days and throughout the years can influence the various twists and turns during the career of an individual, according to the horoscope. And horoscopes can be designed to predict those career changes from day to day and year to year based on astrological changes and positions. People who believe in horoscopes often times will react based on their daily horoscopes and seek out people of various astrological signs in the belief they are more compatible with people of other signs, for example. They also might spurn people born under certain signs under the belief they are not compatible or might possess some sort of undesirable traits. Many times, a daily horoscope will suggest people of one or more astrological sign will be particularly beneficial on a given day or caution the reader to avoid people of certain signs. Those who take such predictions seriously many times will abide them. Critics of horoscopes point out they are strictly generalized and do not offer specific information when it comes to the predictions. There also could be an aspect of suggestibility in which someone reads his or her horoscope and then attributes anything occurring during the day that is remotely similar to it to the horoscope’s prediction. If someone’s horoscope suggests wealth will be found that day and that person finds a dropped quarter on the floor of a local store, the horoscope might get the credit instead of circumstance, for example. The strong interrelationship between horoscopes and astrological signs makes it possible for some people to make long-lasting, profitable careers out of following the astrological movements of planets and stars and issuing predictions based on various factors. When certain planetary alignments occur during a particular year but not others, an astrologist likely will create a horoscope prediction based on the unique event. For believers and non-believers alike, horoscopes offer entertainment and continue to be published regularly in newspapers and other reputable publications. Many times, horoscopes are found on pages strictly devoted to entertainment, such as the comics page. But they also might be featured in other sections, much like crossword puzzles. No matter where horoscopes appear or what they predict, they remain items of curiosity while utilizing a combination of science and superstition.